The demand for large high-speed wave piercing catamarans has developed strongly over the past two decades for their superior performance in commercial and military applications. In severe sea conditions, wave piercing catamarans experience a unique transient loading, known as slamming, when incoming waves impact the centre bow and the wetdeck. Mathematical models up to date have failed to predict the impact loads accurately as most codes are based on two dimensional simulations which have predicted up to five times the actual loads. Three dimensional codes are still under verification which is difficult due to the lack of published trials data. Incat Tasmania monitored the performance of most of their vessels in terms of motion and structural behaviour. A 98m Incat platform, HSV2-SWIFT, that was configured for military operations underwent an extensive sea trials program by the US Navy to define the vessel’s operational envelop. Data measured during sea trials of motion and structural response has been analysed using the wavelet transform. 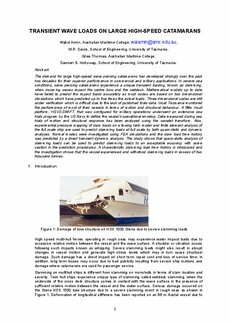 Also, experimental pressure mapping of slam loads on a towing tank model and finite element analysis of the full scale ship are used to predict slamming loads at full scale by both quasi-static and dynamic analyses. Normal modes were investigated using FEA simulations and the slam load time history was predicted by a direct transient dynamic analysis. The study shows that quasi-static analysis of slamming loads can be used to predict slamming loads to an acceptable accuracy with some caution in the prediction procedures. A characteristic slamming load time history is introduced and the investigation shows that the vessel experienced and withstood slamming loads in excess of two thousand tonnes.